I’ve spent some time thinking about this and wasn’t sure if there was a person in my life that I needed to let go, or someone that I wish I didn’t know. There has to be someone, right? Well, I thought about it for a while more and it finally came to me. When I was married to my first husband we had many friends in common, male and female. There were a couple (female) with whom I became very good friends with. We had a great friendship, talked every day, and got together at least once a week. They were there when I had my youngest two daughters, with us for holidays, birthdays, and we even all went on a vacation together. They were two of the closest friends that I had ever had. When my husband and I split up and divorced the friendships became strained. I will admit that part of it was my fault and I apologized for it, more than once. They chose sides and it wasn’t mine. I quickly learned that they weren’t as good of friends as I thought. I was devastated. After some time had passed we started talking again, but it wasn’t the same as before. Friend #1 wasn’t sure if she could be a friend again and friend #2 wouldn’t speak with me at all. I thought that if persisted and worked at it we would rebuild a friendship. I emailed and tried to start and maintain conversations to no avail with friend #1. She’s invited me over and I’ve gone over to hang out, but things were tense or maybe it was just me that noticed it. She hasn’t come to my home though. Eventually friend #2 came around and started talking to me again. Whenever we see one another we talk for a while and catch up, but we’re not friends like we were. Just acquaintances. I think that if I needed something or if one of the girls did she’d try her best to help me. I’ve know for a long time that we won’t rebuild those friendships, nor will we come close to it. There will always be distance between us and this saddens me. I hope that I will have a close friendship again like that. I’ve come to realize that I need to let them go. The friendships are over. Done. 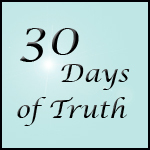 Want to know more about 30 Days of Truth? Check out the first post here! I’m sorry if you’ve been following along and didn’t see a new post on Sunday. I took the day off! Day 4 — Something you have to forgive someone for. I started this post Sunday evening and couldn’t think of something that I needed to forgive someone for. I slept on it. And now I am back thinking about it again. To be honest, I can’t think of anything. I know… I know. Sounds pretty weird doesn’t it? I am sure that in my lifetime something has happened and I need to forgive the person. But I am the type of person that doesn’t let things get to me or take things to personally. And if there is something that has really bothered me eventually I let it go because there is no reason to be mad or upset with a person for a long time. Life is short and we shouldn’t spend our time being angry with people. Let it go, move on, and enjoy life. Oh, you’re wondering about my parents? Did I forgive them for the way they acted? Yes, I did a long time ago. Again, life it to short to hold a grudge and they are the only parents I have. Day 3 – Something you have to forgive yourself for. That quote is from the song “Little Lion Man” and my great friend Jill from Single Mom on a Budget Tweeted it on Friday and I told her that it’s the perfect quote for today’s prompt. I had to use it. The first thing that came to mind is something that I’ve been dealing with and have pretty much come to terms with. But I’m not ready to share that with the world (or my small corner of it) yet. Maybe someday. Instead, there’s something else I’ll share that I’ve forgiven myself for. Most of you know that I have 4 kids. But what you may not know is that they all don’t have the same dad. As a matter of fact they have 3 different dads. Go ahead…. think it… say it in the comments….I can handle it. I have made many mistakes in my life and have learned from those mistakes. That’s part of being human. If we didn’t make mistakes or wrong decisions then there would seriously be something wrong with us and we’d never learn anything. When my oldest daughter was born I wasn’t married, but I was engaged to the person that I thought that I was going to spend the rest of my life with. I didn’t see it at the time but my parents didn’t like him. As a matter of fact they were very upset with me when they found out that I was pregnant and when I went into labor and had my daughter none of my family was there. Everything was great for a while and then things changed. He was more controlling, he was gone a lot more than he used to be… working he told me, there were lies on top of lies that I just didn’t see. My eyes were finally opened and I was able to see what was going on. I moved out and back in with my mom. Many times he tried to get me to come back. Thankfully I didn’t. Later I met my first husband, when my daughter was almost 2. He was great with my daughter and she loved him. I suppose that you can figure out what happened…. Yup, pregnant. And of course this time my parents were very vocal about their disappointment in me. I was upset. Angry. Hurt. My dad was actually talking about disowning me. It was the worst feeling ever and I didn’t know what to do. I didn’t know how to get my parents to change their minds about everything and more so my dad. Once again my family wasn’t there when I delivered my 2nd daughter. My in laws were there though and were very supportive. Almost a year later we got married and 2 years after that we had daughter number 3. This time my family was very accepting of the pregnancy and there were no comments or anything. It was all because I was married and having a child out of wedlock was wrong. Unheard of. It brought shame upon them. Eventually, that relationship ended. Again my parents were upset with me. They wanted me to work it out and make the marriage work. But it wasn’t possible for many reasons that aren’t part of this post. I love my parents and I know that they’ve always loved me. And I know that they’ve always wanted the best for me. But it hurt me when they reacted the way they did and it hurt when they spoke the words they did. And it was my fault. Every bit of it. I carried the hurt around for a long time. And for just as long I knew that it was my fault. Time passed and as it did I learned that it wasn’t all my fault and that part of it was them and a lack of communication. I had to learn to forgive myself and stop feeling like I failed my parents and accept that I have the most beautiful children. That I made decisions that changed my life for the better and my parents as well.